The Vagabond syndicate are determined to make the most of her centenary season with special events, clothing, sail markings and hopefully success on the water. The most noticeable feature will be the special sail markings, with Vagabond 1907-2007 along the boom and mast. The syndicate are also having special polo shirts, caps and jackets made to ensure appropriate smartness on the water! And to mark the special year, sparkling wine, courtesy of the Vagabond syndicate, was served on the Sunday of Bourne End, at 1800, just before the cocktail party, to toast both Vagabond and the rater fleet. We are so used to having them around that it’s easy to forget that the Thames A Raters are living history, a direct link with the dawn of competitive small boat sailing in Britain, and raced as enthusiastically now as they were in Victorian and Edwardian times. The oldest surviving rater dates from 1898, and all of them carry the traditions of a class which played a notable part in the growth of small boat racing on the Thames and across the UK. 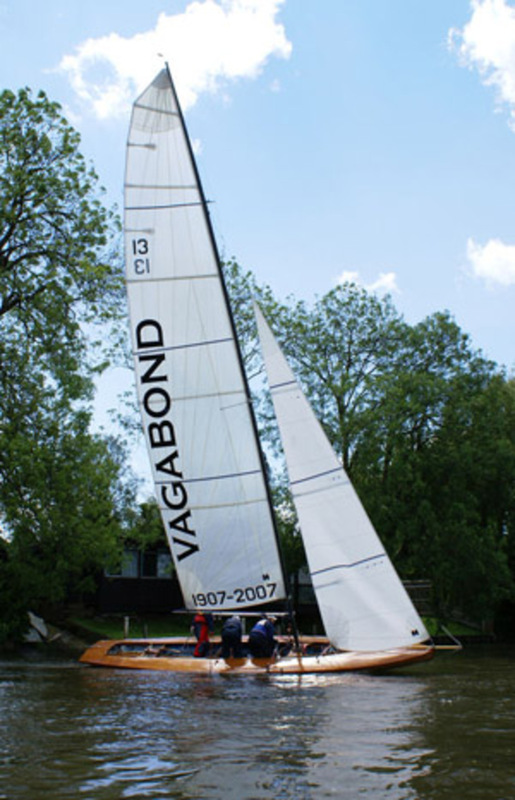 However Vagabond has particular significance in the wider history of dinghy and small boat racing, because it carried the very first example of what became the trapeze, now a standard feature of performance sailboats. 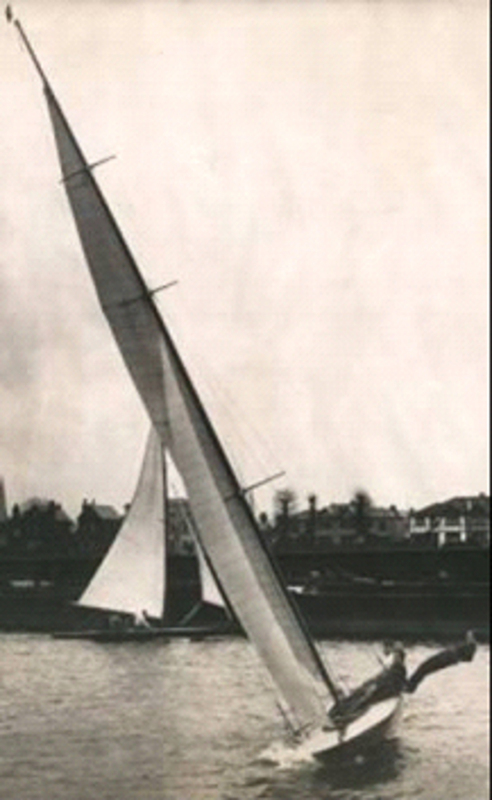 It was probably also the first conventional sailboat to adopt the sliding seat, previously only used in racing canoes. Over this period famous names in sailing dinghy history, such as John Winter, Beecher Moore and Peter Scott, all sailed in Vagabond. Vagabond is also of course a fine example of the art of its designer, Linton Hope. It was he, who in the later Victorian era, challenged the conventions of yacht design to produce the light, shallow draft ‘skimming dishes’ that were the most exciting racers of their day, outpacing big, deep draught, heavily crewed yachts with much larger rigs. Active in the yachting press, he was a true innovator, his influential designs ranged from seagoing yachts to sailing canoes. Although built in 1907 it was not until the 30s that Vagabond made her mark, when bought by Beecher Moore. Moore, an American, is best known for his partnership with Jack Holt, designer of many of Britain’s best known and most popular dinghies, such the Merlin Rocket, Enterprise and Solo. But raters were the foundation of his dinghy career. An innovator himself, he made Vagabond’s mast taller and taller to carry more sail, and then needed to find a way to keep his powerful beast, with its 45’ mast upright. His answer, in his own words, was the ‘bell rope’, I used a loose wire which went to the hounds, the lower half of which was of rope with big knots in it which we called a bell rope. Bill Milestone was my first crew to hang out over the side on this with his feet on the gunwhale, and it gave us great success. But its translation to the wider stage came when Peter Scott tried it out while crewing with Beecher on Vagabond. Scott is famous as the father of wildlife conservation, a bird painter, and war hero, but when he crewed for Beecher was also one of the best International 14 sailors at a time when the 14s represented the leading edge of dinghy sailing. Scott in his own words ‘took the invention a stage further by the use of a harness to be worn by the crew’. The trapeze was born, and using it Scott, with crew John Winter, won the 1938 Prince of Wales Cup. Moore had also been impressed by the effectiveness of sliding seats on sailing canoes, and at one stage fitted three, one for each crew member. This was another first for conventional sailing boats, and sliding seats were at one stage very popular with a variety of performance dinghies. Within Thames SC Vagabond is also memorable for being the first wooden rater to have a comprehensive (ie expensive) restoration, at a time when the ‘plastics’ seemed to rule the roost. Since then other rater syndicates have followed the same route and now a fleet of speedy wooden raters compete on equal terms with their GRP rivals. Indeed in recent years Vagabond has been very successful. Now in her centenary year this remarkable boat is not only a significant example of yachting history, but also continuing to do what she does best ‘looking good and sailing fast’ as a tribute to her illustrious designer and all those who have preserved her over the last 100 years.